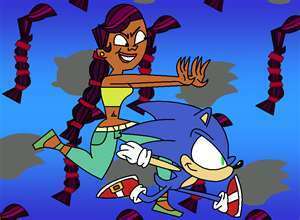 sierra and sonic. sonic and sierra are running for thier true প্রণয় NOT. Wallpaper and background images in the Total Drama World Tour club tagged: tdwt. This Total Drama World Tour fan art contains নকল মানুষের, কমিক বই, কমিকস, and কার্টুন.